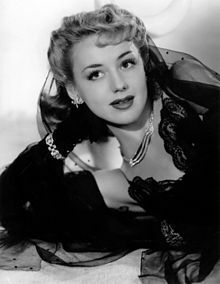 Anne Shirley (born Dawn Evelyeen Paris, April 17, 1918 – July 4, 1993) was an American actress. Beginning her career as a child actress under the stage name Dawn O'Day, Shirley adopted the name of the character she played in the film adaptation of Anne of Green Gables in 1934, and achieved a successful career in supporting roles. Among her films is Stella Dallas (1937), for which she was nominated for an Academy Award for Best Supporting Actress. She retired from acting in 1944, at the age of 26. She remained in Los Angeles, where she died at the age of 75. 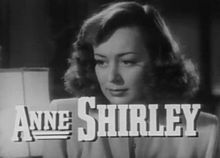 Born in New York City, Shirley began acting under the name of Dawn O'Day. As a baby she began modeling, and made her film debut with a featured role in 1922's Moonshine Valley. Shirley began acting at the age of five as the live action "Alice" in Walt Disney's pre-Mickey Mouse silent animated series "Alice in Cartoonland". She had a highly successful child star career in Pre-Code movies, appearing in such films as Liliom, Tom Mix's Riders of the Purple Sage, So Big, Three on a Match and Rasputin and the Empress. In 1934 she starred as the character of Anne Shirley in Anne of Green Gables, and took that character's name as her stage name. After adopting the name Anne Shirley, she starred in Steamboat 'Round the Bend, Make Way for a Lady and Stella Dallas, for which she was nominated for the Academy Award for Best Supporting Actress. Later roles were in such movies as Vigil in the Night, Anne of Windy Poplars, The Devil and Daniel Webster and Murder, My Sweet, her final film. Of Shirley's portrayal in Saturday's Children, The New York Times commented that she "endows the little wife with heroic integrity and strength of character." Shirley married actor John Payne on August 22, 1937, in Montecito, California. They had a daughter, former actress Julie Payne. Her second husband was film producer and screenwriter Adrian Scott. When he was blacklisted and decided to move the family to Europe, at the last minute she wrote him a "Dear John" letter saying she'd rather stay behind and divorce him. Her third husband was Charles Lederer, nephew of Marion Davies. They had a son named Daniel Lederer. Shirley had also a brief relationship with younger western star Rory Calhoun and another with French movie star Jean-Pierre Aumont. Shirley died from lung cancer in Los Angeles, aged 75 on July 4, 1993 and was cremated. For her contributions to the motion picture industry, she has a star on the Hollywood Walk of Fame at 7020 Hollywood Blvd. ^ "Anne Shirley At Weller". The Times Recorder. Ohio, Zanesville. July 7, 1940. p. 16. Retrieved July 13, 2016 – via Newspapers.com. ^ a b Shipman, David (October 22, 2011). "Obituary: Anne Shirley". The Independent. Retrieved November 1, 2015. ^ "Information Desk". Modern Screen. July 1935. p. 10. Retrieved November 1, 2015. ^ Crowther, Bosley (1940-05-04). "THE SCREEN; John Garfield and Anne Shirley Seen at Strand in 'Saturday's Children'--'Star Dust' at Roxy". The New York Times. New York City: The New York Times Company. para. 4. ISSN 0362-4331. OCLC 1645522. Retrieved 2011-01-03. ^ "Anne Marries". News-Journal. Ohio, Mansfield. United Press. August 23, 1937. p. 10. Retrieved July 13, 2016 – via Newspapers.com. ^ "The Red and the Blacklist" by Norma Barzman. Wikimedia Commons has media related to Anne Shirley. This page was last edited on 11 April 2019, at 11:53 (UTC).